Thanks for your attention to Gootium, please check our other listings for more high quality canvas bags. If any further questions, please don't hesitate to contact. 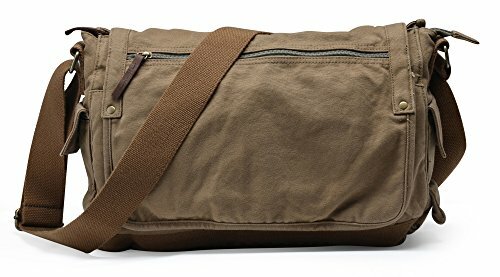 ✔ MATERIAL - Made of heavy-duty canvas, lined with soft cotton fabrics, this messenger bag was endowed with durable performance. Garment wash for the finished product adds soft and comfortable touch to it. ✔ DIMENSIONS - (L) 15.7" x (W) 4.3" x (H) 11.3"; Item weighs 2.1 Lbs; Capacity of 12.6 Liters. ✔ DOUBLY SECURE - The main compartment features a combination of Velcro strap and zipper closure. you get extra security when you want it, and extra fast access when you don't. ✔ LARGE CAPACITY - Spacious main compartment with well located pockets offer sufficient storage space for daily essentials like 15.6-inch laptop, DSLR set (*Better in protective sleeves or cases) and other file folders or magazines, it switches from work mode to play as fast as you can. ✔ REFINE CRAFTSMANSHIP - Well-made zipper with leather trim puller, even & smooth stitching and reinforced stress points for protection and durability feel. This lovely shoulder bag is built to withstand whatever circumstances you may encounter during your daily or outdoor activities. If you have any questions about this product by Gootium, contact us by completing and submitting the form below. If you are looking for a specif part number, please include it with your message.